We’re pretty sure that nobody ever accused Patrick Huston of being smart. 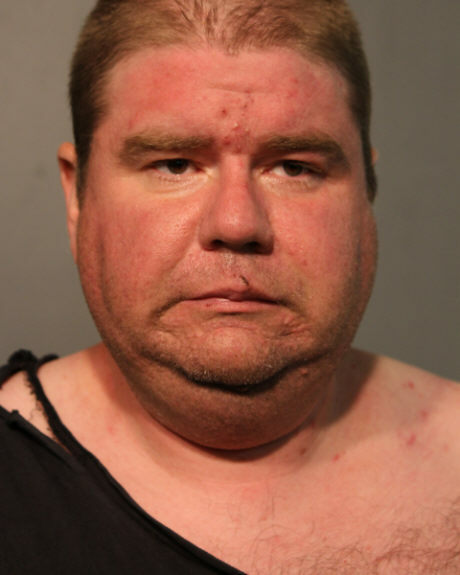 Paroled in March after serving part of a 4-year robbery sentence, Huston was arrested Saturday after he allegedly robbed (and tried to rob) several people near Sheffield and Belmont. The first victim called 911 at 1:15AM Saturday to report that a heavy-set white man with a bandana over his face claimed to have a gun and to tried to rob him and another group of people near Barry and Sheffield. Minutes later, a doorman at Berlin nightclub called 911 to report that a white man with a bandana on his face claimed to have a gun in an apparent robbery attempt. Police soon arrived and the 280-pound Huston was arrested 2 doors west of Berlin after a predictably brief foot pursuit. Cops never found a gun on Huston, but they did round up a number of alleged victims. Prosecutors are now preparing three counts of aggravated robbery and one count of resisting police against him, according to police records. Huston, 38, was paroled on March 18 after serving a little more than half of a 4-year prison term that he earned for robbing a Quiznos in the 3900 block of N. Broadway in 2012. Minutes before knocking off the Quiznos, Huston failed in an attempt to rob a Subway sandwich shop less than a block away, cops said at the time.